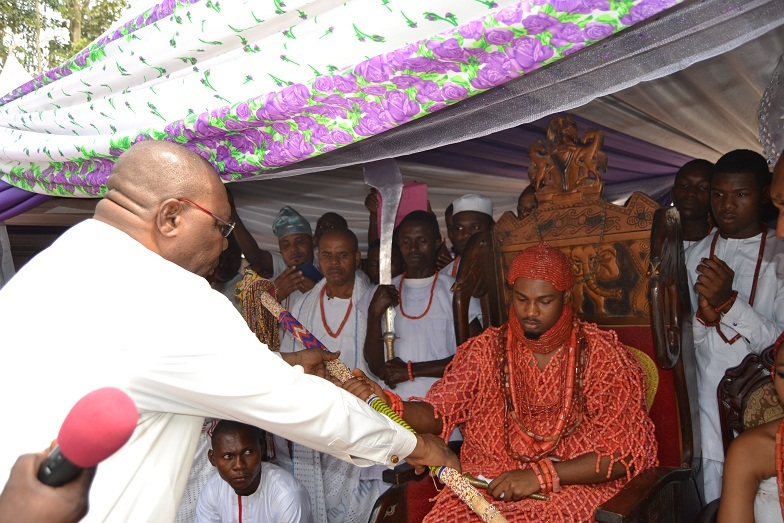 History was made in the ancient Oligbo Kingdom of Issele-Uku, the administrative headquarters of Aniocha North Local Government Area of Delta, on Thursday 29th December, 2016, when His Royal Majesty, Obi (Engr.) 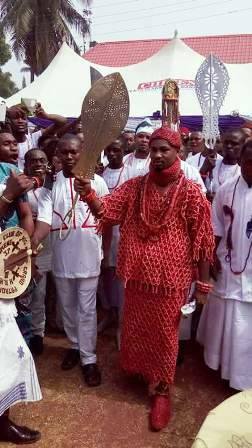 Nduka Ezeagwuna ll was officially presented with his Staff of Office, as the new Obi of Issele-Uku, by the Delta State Government. In his address at the occasion, the Delta State Governor, represented by the Deputy Governor, Barr. 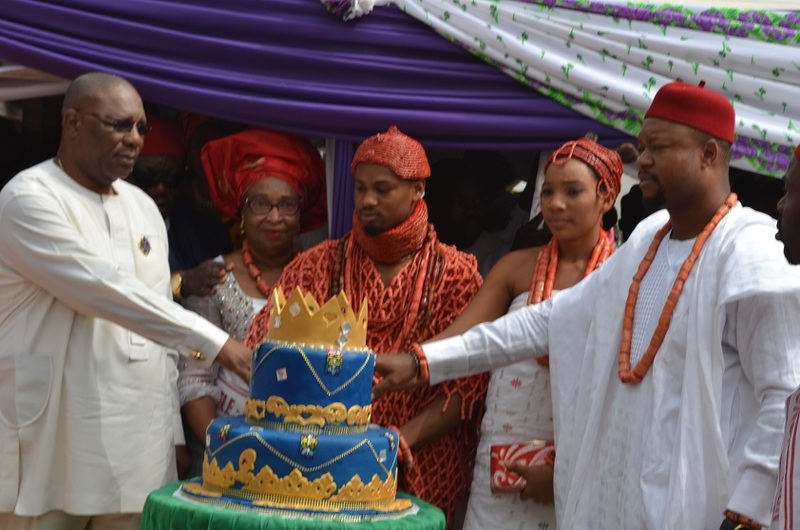 Kingsley Otuaro, congratulated His Royal Majesty, Obi Nduka Ezeagwuna ll on his enthronement as the 20th Obi of Issele-uku and while recognizing the great relevance of his divine emergence as a very young Monarch in a critical time like this for the country, urged him to rule his people with the fear of God and courage that comes from God, stressing that he should at all times listen to the voice of his people and carry them along during his tenure. Governor Okowa also encouraged the young Monarch to adopt democratic principles as his leadership guide and while adding that he should work towards strengthening the cultural values of the people of Issele-Uku kingdom, charged him not to disappoint his people as well as the State Government. Speaking in his welcome address, the Executive Chairman of Aniocha North Local Government, Hon. 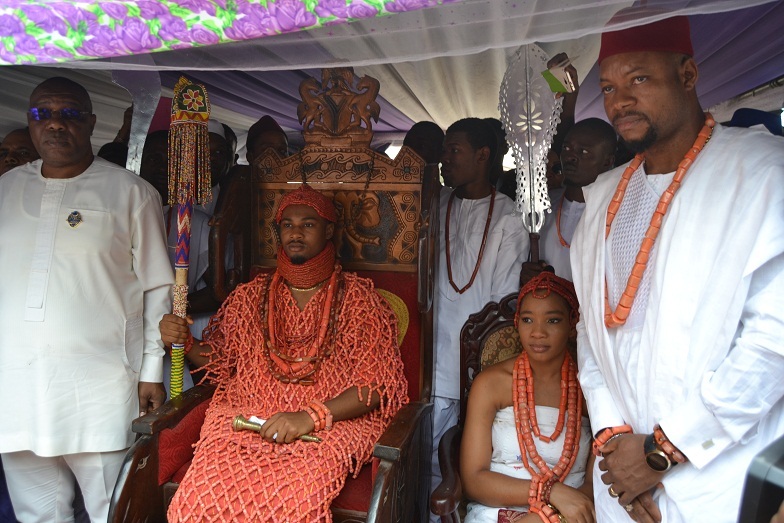 Chuks Oseme commended the people of Issele-uku kingdom for the peaceful, seamless verification and authentication process that hallmarked the journey and ushered the final enthronement of Obi Nduka Ezeagwuna ll as the Obi of Issele-Uku, to the throne of his ancestors, even as he urged the new Monarch to uphold and propagate the principles of equity and fair play to his subjects in the discharge of his royal responsibilities. 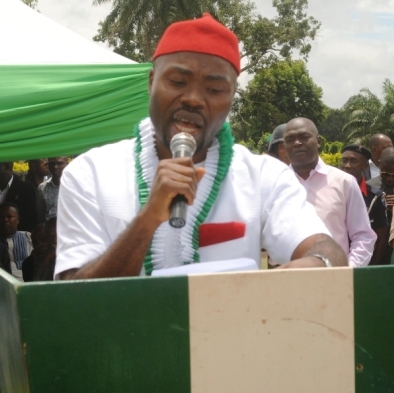 In his message, the member representing Aniocha North State Constituency in the State House of Assembly, Hon. Engr. 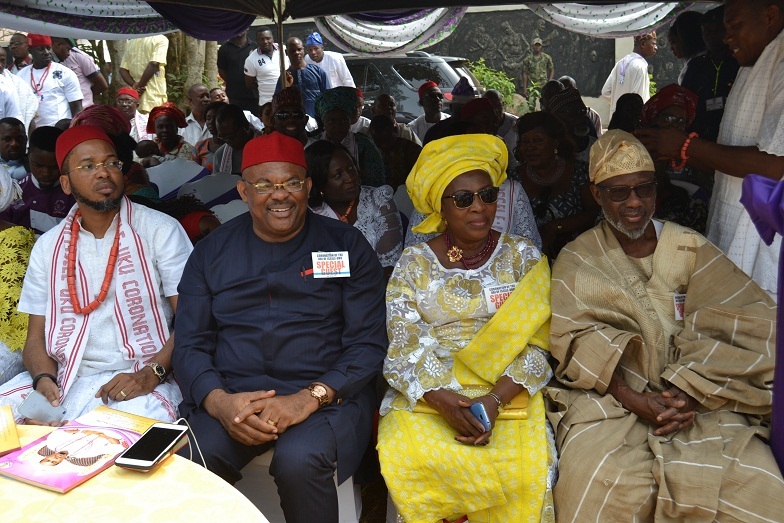 Emeka Nwaobi congratulated the Obi for successfully ascending the revered and ancient throne of his forefathers, and while praying that God would grant him wisdom and strength to effectively lead his people to a greater level of glory. He then appreciated the State Governor, Senator Dr, Ifeanyi Okowa for his active participation in the overall success of the coronation and presentation of Staff of Office, through his numerous infrastructural development initiatives that could be seen within and outside the Issele-uku metropolis. Earlier in his coronation address, His Royal Majesty, Obi Nduka Ezeagwuna ll, expressed his profound gratitude to God for his guidance and direction throughout the process to his enthronement and while revering the memory of his late father King Ezeagwuna (I) for the love and proper upbringing he bequeathed to him, equally paid great tribute to His Mother, the Queen for her unwavering support, as well as His Royal Majesty, Oba Ewuare ll, the Oba of Benin Kingdom who, in recognition of the royal bon between Benin and Oligbo Kingdoms, ensured that the pre-coronation royal orientation was carried out in his esteemed palace in line with the tradition and culture of the people of Issele-uku. “The profound mentoring i was privileged to receive from him while there reassured me of my affinity and strong roots. 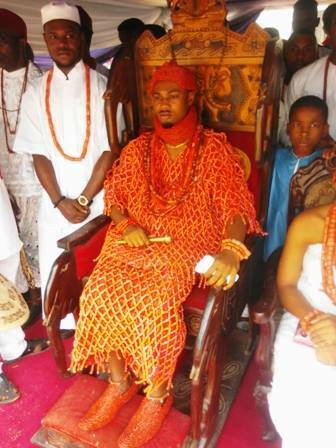 The exposure has strengthened my confidence in confronting the task of leadership of my people.” Obi Ezeagwuna II, said. The new Issele-uku Monarch also expressed his profound respect and gratitude for the regent, Prince Dominic Egbune, who held forte in the Palace, as he completed his Degree Programme at the Faculty of Engineering, University of Ibadan and while pledging to restore the past glory of Issele-Uku Kingdom by way of reinterpreting the various accounts of the History of the Town with a view to giving them modern and technological expressions, Obi Ezeagwuna ll stated the modernity of Issele-uku of his dream would be anchored on the culture and tradition of his people. 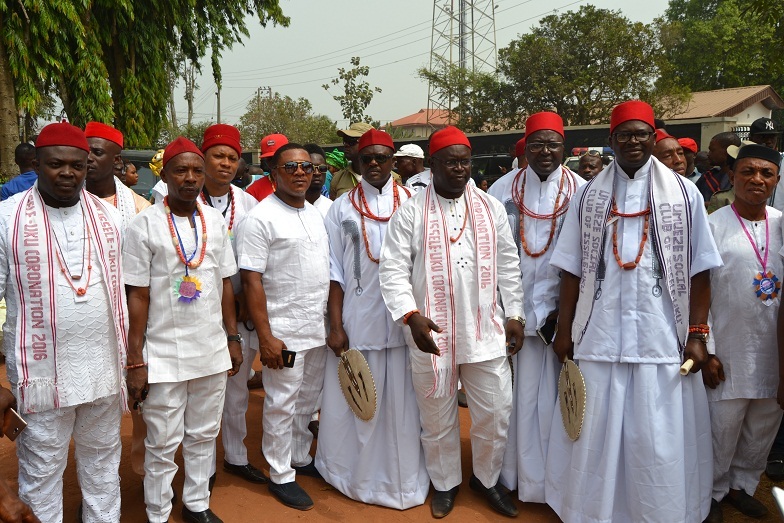 “I will pursue the regeneration of our culture and tradition; the ine festival will be rejuvenated; our folklore and folk tales, traditional songs and dances will be revived and promoted.” the Obi assured, as he called on his people to join hands with him to move the town to greater heights and achievements. He appreciated the Delta State Governor, Senator Dr. Ifeanyi Okowa for the critical role he played in ensuring the success of the ceremony and assured him of the continuous loyalty of the people of Issele-uku to his administration. The Coronation ceremonies had commenced properly when the young, handsome Obi Nduka Ezeagwuna II, Obi of Issele-Uku, decked in complete all-bead royal apparel, synonymous with the rich cultural glory and majestic splendor of ancient Bini Kingdom, strode into the palace grounds and was ushered into the event venue at the Oligbo palace, by kingmakers and palace guards at exactly 12.30 p.m. with his entourage. 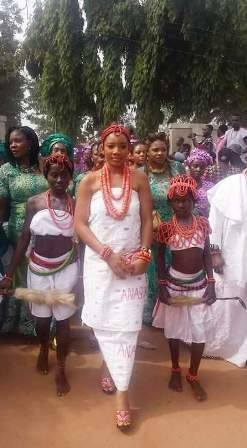 His arrival had been preceded a few minutes earlier by the entrance of his wife, the young, beautiful and calm Queen Rosemary Chukwudumebi Ezeagwuna (Anasi of Issele Uku) and her palace maidens and sisters, as she walked elegantly to take her place on the chair specially positioned next to her husband’s seat. The occasion was witnessed by top Government functionaries including the Minister of State, Petroleum Resources, Dr. Ibe Kachikwu, who represented President Buhari at the ceremony, the member representing Aniocha/Oshimili Federal Constituency in the Federal House of representative, Rt. Hon. Onyemaechi Mrakpor, as well as the Royal presence of the legendary Obi of Onitsha, His Royal Majesty, Obi Alfred Achebe and the high powered delegation from His Royal Majesty, Oba Ewuare ll, the Oba of Benin Kingdom. Also at the occasion were members of Delta State House of Assembly like Princess Pat Ajuduah and led by member representing Aniocha North State Constituency in the House, Hon. Emeka Nwaobi who played a pivotal role in ensuring a successful royal event, members of the Delta State Executive Council including the honourable Commissioner for Lands and survey, Chief Dan Okenyi, the Chairman of Delta State Civil Service Commission, Chief Nkem Okwuofu, Chairmen of Local Governments in the State including the Chairman of Aniocha North, Hon.Chuks Oseme, a former Chief of Defence Staff, Air Marshall Paul Dike, as well as the revered Sculptor Demas Nwoko, amongst others. 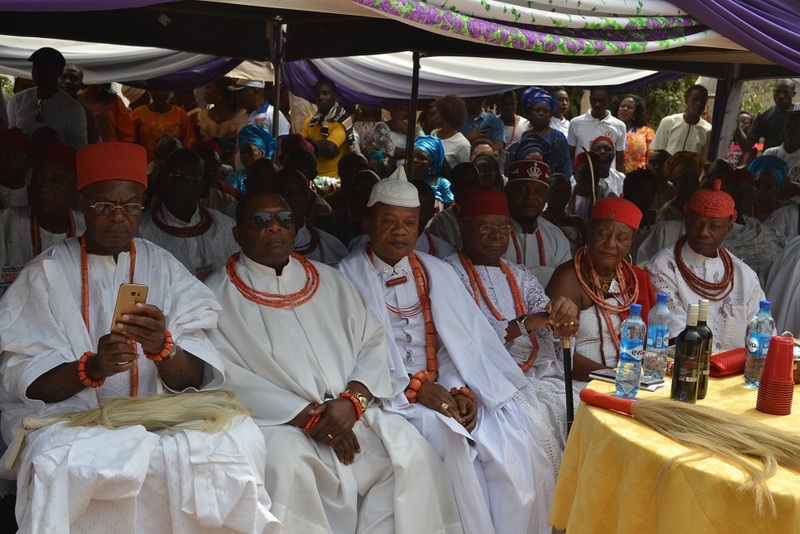 Their Royal Majesties and members of Delta State Traditional Rulers Council and members of Aniocha North Traditional Rulers Committee led by their Chairman, His Royal Majesty, Obi Emmanuel Mohanyem, the Obi of Ezi, and the Omu Anioma, Obi Martha Dunkwu, were also present in their full cultural elegance and the members of the Clergy led by His Lordship, Most Rev. Dr. Michael Odogwu Elue, the Bishop of Issele-Uku Catholic Dioceses also graced the occasion. 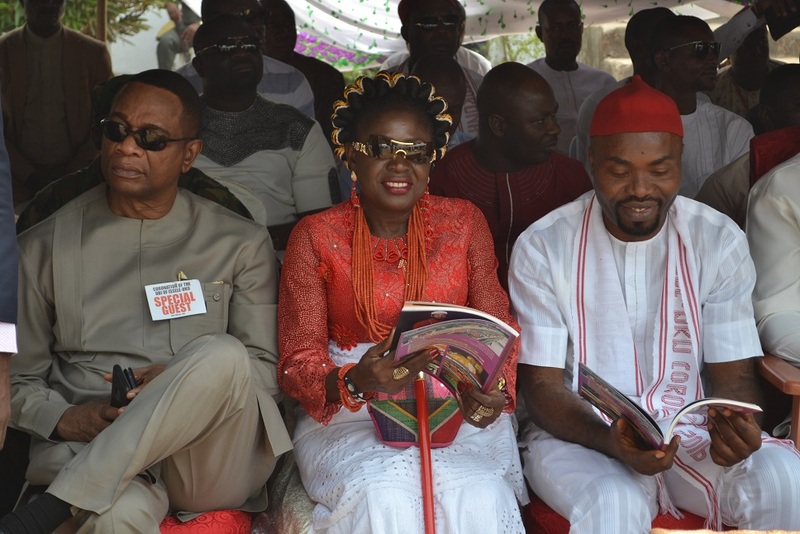 A trio of excellent broadcasters and respected Comperes, Ngozi Odiwe of Delta Broadcasting Service, Asaba Chief Ben Anazia and Chukwudi Okolie Ugbaja, mastered the ceremony and the renowned Edo Cultural Arts Council as well as Delta State Council for Arts and Culture Troupes, were at the event to entertain the mammoth crowd that filled up the palace grounds and spilled over the palace gates into the area where a large screen Television had been erected to beam live streams of the royal proceedings to people who had occupied the tents and canopies set up for the historic coronation event.